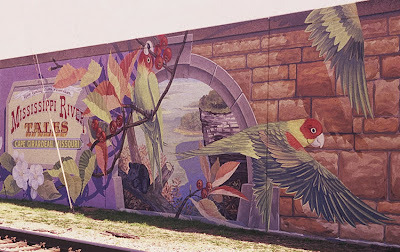 The Mississippi River Tales is a mural containing 24 panels covering nearly 18,000 square feet (1,700 m2) of the 15-foot (4.6 m)-high downtown Floodwall in Cape Girardeau, Missouri. It illustrates the history of the area beginning with the Native Americans who inhabited the area between 900 and 1200. Each panel tells a story. The mural was painted by Chicago artist Thomas Melvin, in collaboration with several local artists, and was dedicated at a public ceremony on July 7, 2005.